3. Why Rome built an empire? First, people usually have a quite good knowledge about the history of Rome in times of late Republic (I-st century BC) and history of Roman Empire after Caesar. But, as I mentioned before these times Rome was no more a democracy, but a populistic country. And a common knowledge about the history of democratic period of Ancient Rome history (449 - 133 BC) is usually very poor. Second, we have limited historical sources about early ages of Rome. Everything before year 500 BC is half-legendary (like Lykourgos in Sparta). I think that most of the facts in Roman chronicles are generally true, but it is my personal opinion (that roots from laws presented here). Moreover, most of the chronicles that describe the early ages of Rome were written in times of late Republic, so are not always impartial. Good place to start, if you are looking for facts from the History of Rome. And some maps Ancient Rome (and other ancient countries). Here is quick overview of Early Roman History (by Frank E. Smitha) and Little more detailed (by Robert F. Pennel). Plus Historical Atlas by William R. Shepherd. Or If you prefer simplier maps: The Historical atlas of Roman Empire. Or some detailed Maps of Ancient World. Short information about persons, states, events, etc. you can find in Wikipedia (Etruscans). Traditionally Rome was founded in 753 BC by Romulus. Next king Numa Pompilius created the senate. Roman nobles (patricians) very early gained political privileges and thus in times of Etruscan kings (617-509 BC) Latin Rome was feudal state with extended political institutions for nobles. This subclass of feudal system is called a “feudal democracy”. As I said before, Rome became populistic state in the year 509 BC when citizens of Rome banished Etruscan king Tarquinius Superbus, and after a very short time (only 60 years after) in 449 BC Rome city-state became democratic country. What was the reason for so fast political evolution? First, feudal and then populistic Rome have no place to expand because have many strong neighbours: Etruscan city-states and Latin tribal states, so its political system could not decompose because of too many conquered lands. Moreover, for the same reason, the war was always was the worst strategy of increasing wealth for Romans. Trade and export were more profitable. Rome was important intermediary in salt trade that goes thorough the city (which made merchant class stronger), and an exporter of agricultural products (which turned Roman peasants into farmers). Rich Etruscan city-states these times colonized the Northern Italy and were a great market to sell Roman agricultural products. Because of reasons mentioned above feudal Rome under the rule of Etruscan kings became the “feudal-democracy”. Etruscan kings have limited power (probably were even elected by Roman nobles), and noble class (patricians) had many political privileges. As the example of England (1642-1689) proves, when the feudal state with “feudal-democracy” becomes populistic, very quickly turns into democratic country, if the external economic conditions are good. After the banishment of Etruscan kings (509 BC) Rome became a republic. It was a small populistic city-state that waged many, but rather small wars in close vicinity (no more than 50 miles from Rome), and its political system evolved step-by-step evolve through many conflicts between patricians (who ruled the city) and plebeians who had almost no political rights at the beginning. In 494 BC plebeians made the First Seccesion - they went out from the city threatening that they will not work and fight for patricians. With that “strike” they gained a special representation: plebeian tribunate - a few special city-officials (or ombudsmen), who could negate the laws created by Roman senate dominated by patricians, and have political immunity (no one citizen could kill plebeian tribune). That privilege made the further political struggle conducted by plebeians against the patricians senate much easier. It useful to note that this success shows the economic strength of plebeians. If plebeians position had been weaker, they would have been pacified with brute force by richer citizens. With that institutional protection plebeians could fight for their rights more effectively. Finally, after the 45 years of (sometimes brutal) struggle, the populistic system ended. In 451 BC the Commission of Ten was nominated to write down law regulations which was demanded by plebeians. These times courts (or law enforcement) were dominated by patricians who often abused law against plebeians, taking advantage of fact that law regulations wasn’t written down. But the 10 patricians, who were nominated to the Commission, tried to rule Rome as long as possible and refused to include plebeians postulates into a new codex. Here you can find short summary of Political Evolution of Ancient Rome (Struggle of Orders). And alphabetical index of Roman Laws. Titus Livius about the struggle of orders - book 4.
a law that prohibited to create a city office (institution) from which decisions a citizen of Rome couldn’t appeal to some other city institution (ius provocationis). In other words: a citizen should always have a right to appeal from arbitrary administrative decisions. Democratic system usually starts when different GPIs (groups of political interests) have not enough power to dominate other GPIs, not because of politicians become honest and intelligent or country inhabitants become more mature. Democratic system is simply an effect of a draw situation in the struggle for power. Since then the polity of Rome were changed in an evolutionary way. And finally after a many decades of political struggle (but waged in democratic manner) plebeians acquired the law to be elected on every city office (originally most of offices were accessible only for patricians). It is useful to compare this evolution with the evolution of Great Britain political institutions in XVIIIth and XIXth centuries - Struggle of Orders between patricians andd plebeians resembles the conflict between Whigs and Tories. To be honest: usually in democratic manner. There were some exceptions. For example in 439 BC a rich plebeians Spurius Melius, who presented grain for free, buying this way a political votes for himself, was killed by an army officer who had been ordered to arrest him. It is rather a continuous, never-ending struggle to protect democratic institutions against government abuses and manipulations (and sometimes against the manipulations started by political opposition too) or against the corruption. The criminal methods of making politics sometimes happen in democratic system, but are exception rather than the rule (opposite as in populistic system). But generally the laws of twelve tables and political institutions of Rome worked fine for over 300 years. And the higher rationality of democratic system gave Rome an important advantage over all of the neighbouring countries. Of course in democratic system political ideologies have no such power like in populistic country, but this doesn’t mean that ideologies are not present in democratic country. Even in democratic system more than 95% of citizens are making their political choices under the influence of some ideology. Overall effect is rational only because they believe in different ideologies. Rationality of democratic system is an effect of a free market of ideologies, an effect of freedom and pluralism in the world of ideologies. But under some conditions, (ex. when the dangerous or profitable war comes), there is a chance that political life in democratic country will be strongly saturated with ideology. There was the senate of Rome (SPQR) that was something like a higher house of parliament or a government. The members of the senate were former city officials. There were a number of institutional guaranties which protected the civil rights of every citizen: ius provocationis, immunity of plebeian tribunes, independent courts, legal system rooted from Laws of Twelve Tables. These guaranties had similar function as British Bill of the Rights or Amendments to the Constitution of USA. concilia plebis. Meeting of poorer citizens. A counterbalance for the senate. Had a right to elect plebeian tribunes and other plebeian officials plus some legislative privileges. comitia tributa. Meeting of all citizens organized according to administrational districts. The most democratic meeting. Most of Roman laws (called “lex”) were legislated here. comitia curiata. The older kind of meeting without great importance in times of democratic Rome. Probably have (aside of the other responsibilities) the same responsibilities as the High Court or the Constitutional Court. comitia centuriata. Meeting of citizens organized by the types of military units they belonged to (and the types of military units corresponded with the social status of different groups of citizens). Dominated by patricians, who had privileged representation here. This meeting elected higher city officials. Here you can find a short description of Roman offices and institutions. It is useful to note here, that in spite of privileged position that patricians had in senate and in the comitia centuriata, since the early days of democratic republic a plebeian could be elected even to the highest office (i.e. could not became a consul, but a “military tribune” who generally had the same scope of authority). And with the permanent political conflict between plebeians and patricians (which is typical in democratic states), Rome was surprisingly strong. Ironically it was thanks to this permanent conflict which forced Romans to solve potential social problems before that problems become serious. This is one of the most important strengths of the democratic system. When there is a group (GPI) of 10% richest citizens that group usually has more than 10% share in political life of democratic country. There is nothing strange here, they simply have greater political strength than other groups of citizens. The same is true for educated citizens, they are also over-represented in political life (comparing with their number). This is not honest or righteous, this is effective. When political interests low-income citizens are over-represented, the rate of development is slower, and that country have not enough capital resources to compete successfully with other countries, either on economic nor political and military planes. When political interests of upper-income citizens are strongly over-represented, the costs of protecting a very unfair redistribution of wealth are too high (and the risk of social unrest is very high) making the country’s economy ineffective too. So, democratic country is effective because it maintains the balance. Of course Rome was not a democracy like democratic countries today. Times and people’s mentality has changed, and technological advances made present democracies more “people-friendly” and wealth distribution more righteous. Honestly, there is even a great difference between democracies today and before 1968. But comparing with any other ancient state, ancient Rome was the country of political freedom and much safer place to live. Why Rome built an empire? Now it is time to explain shortly, why Rome built a great empire. But first I have to correct one false image that many people have about ancient Rome. People generally think that Ancient Rome was as a very militaristic state. It’s not true. Let see a map that compare Rome and Athens states about 440 BC Just after Rome changed to democratic system and just before the Peloponnesian War in Greece, when both countries have more or less the same population (150 - 200 thousands of citizens). Athens and Rome 440 BC I have lost the link to the Web site where this map comes from. Please take my apologies. Rome city-state is marked blue. Athens city-state is marked red and its colonies in Athens Sea Union are marked orange. 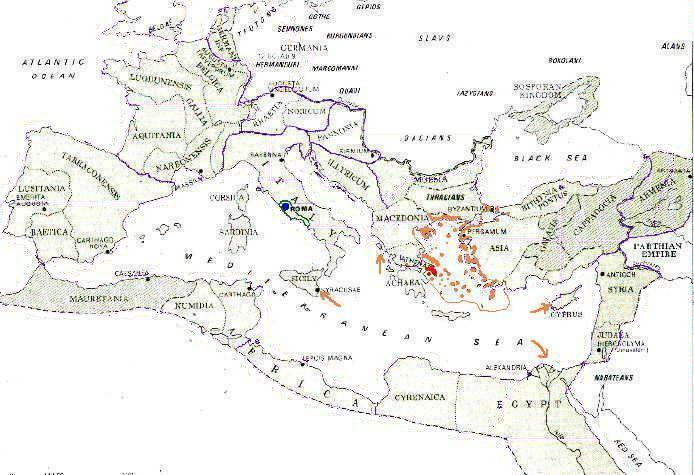 Orange arrows shows the farthest operations of Athens fleet (with troops on board) during the Pelloponnesian War and before (in the age of Pericles). And thin green line shows borders of Rome 327 BC, just before Alexander the Great conquests in Persia that changed economic conditions for whole Mediterranean and Middle East. As you can see, comparing with Athens, and with almost any populistic city-state in the Mediterranean region, Rome was rather peaceful, non-expansionistic state. Actually, a great part of Roman conquests at the early stage of its expansion were the effect of devise “si vis pacem, para bellum” (you want peace, be prepared to wage war) - Romans simply eliminated the potential threats to their state. First, Rome was democratic, so ruling GPI (group of political interests) could not involve the state into a war that would give profits only that GPI, when other GPIs had to pay costs of that war. All costs of every war were evident, no cost were hidden. So, Rome waged only those wars which were necessary because of national security reasons, or were profitable for most of the citizens. Fourth, Rome very quickly adapted and imported technologies from neighbouring countries. Most of the Roman war tactics and military technologies were taken from its enemies. Fifth, divide et impera (divide and rule). (divide and rule). One of the basic tactics that lowers the costs of occupation of a country is to find here an important GPI (conflicted with other GPIs) which will support the rule of the occupier and pay some costs of occupation. It is very easy to find that group in a feudal country, rather hard in a populistic country, and almost impossible in a democratic country. Therefore Rome could use the tactic of divide and impera against almost any enemy, and no enemy could use this tactic against Rome. Generally, democratic country loses a war only when it have to retreat from colonies that had became to expensive to control (like United States for England or Algeria for France).Of course there are no rules without exceptions. There was one war that was completely lost by democratic country: in 390 BC a Rome was defeated and occupied by Celtic tribes. There was many Greek city states and only one Rome city-state. At the beginning Rome had quite low technological level, so more profitable choice was to import technologies from Etruscans and Greeks. Romans invented many new technologies which was not so spectacular as Greek discoveries but had important impact on everyday life (ex. in road and bridge building, construction, law system). We don’t call people like James Watt, Thomas Edison or Steven Wozniak great scientists but their inventions launched great changes in our life. When Rome achieved technological level comparable with Greece, it was so strong country that the state investments (i.e. expansive wars) started to be more profitable than science development. Then in a very short time Rome became populistic state. As you can see, even very strong law of history could be (under some circumstances) negated by a cumulated effect of other laws. It is one of the reasons, why the overall pattern of our history is so complicated. With all conquered lands, the polity of Rome still was the same as when it was a small city-state. Conquered provinces were administrated by former city officials or special private enterprises. Romans usually confiscated from 1/3 to 2/3 of fields from countries they had conquered (Athens usually confiscated the whole land). These fields then became a property of Rome called ager publicus (public land). This land was divided between the citizens of Rome, who organized here farms or plantations. First, a cheap import of agricultural products from newly conquered lands and Egypt started the agricultural crisis in Italy. Many owners of small farms bankrupted, and migrated to the city of Rome where they have better chances to survive the crisis. Rich planters increased the exploitation of slave-workers. Second, rich citizens grew in wealth, because they have better starting position in the race for profits that great conquests of Rome had brought: they could gain a larger farms made from ager publicus, and have a better chance to gain a privilege of administrating the conquered provinces, which was extremely profitable. This way the GPI (group of political interests) of the richest citizens grew in strength, and many very poor citizens arrived to Rome increasing the number of poor educated citizens with no financial independence (because of low-income) who were easy to manipulate by populist leaders. The group of middle-income citizens became overpowered, and that was the economic reason for the fall of democratic system in Rome. GPI of richer citizens formed a faction of Optimates (represented by the senate), and the leaders of poor citizens formed the faction of Populares (represented by plebeian tribunes). At the beginning both factions competed in democratic manner but about 133 B.C a leader of Populares and a plebeian tribune Tiberius Sempronius Gracchus tried to promote an legislation that introduced the agricultural reform: project to divide great farms formed from ager publicus, and gave that land to poor citizens. In counter-strike armed senators killed him and many men from his faction on Forum (a central public square in Rome, the place of political meetings). The year of 133 BC was the moment when democratic institutions of Rome were definitively broken. So, I am nominating this year as the end of 315 years long democratic period in the history of Rome. Of course it is an arbitrary date. Whole process was gradual, and the economic base for democracy decomposed probably a few years (or even decades) before, but democratic institutions suspended the final fall of democracy until 133 BC. The final element of diffusion caused by conquests of Rome was the war with Roman allies in Italy (90-89 BC). In consequence of this war Rome had to grant a privileges of citizens to all free people living in Italy (with edict called lex Julia after young Julius Caesar, who promoted that law). Since then, the core of Empire was the whole Italy, not only the city-state of Rome. Because of economic changes, no matter which politician, or which political option would won, the final result would be the same: some kind of populistic system. Further military expansion was the most profitable way to increase national income, so finally the populistic system in Rome took a form of military dictatorship. When the group of poor citizens is very large, they don’t represent their own political interests but the interests of some other, richer or more influential citizens. They are usually poor educated, with no work or any stable source of income, what made them very susceptible to manipulation by skillful demagogues, populistic ideologies or easy to bribe with relatively small sums of money or cheap gifts. They become clients of some other GPI or a populistic political party, organization, church, charismatic leader, etc. Politicians could buy votes for food (like Spurius Melius mentioned before or Julius Caesar) or for alcohol (like in Kansas in the early XXth century or in modern Russia). Local oligarch could threat them to vote for him, if he have someway a control over their source of income (ex. could stop their wages). Political party like communists in Soviet Union (or some GPI of government administrators) could gain their votes offering social protections and material stability, even if their wages would be relatively low. Ironically, because of the danger of political clientelism, sometimes voting rights in democratic country could be the privilege of smaller group of people than in some contemporary populistic countries. Compare for example France and Great Britain in the last decade of XVIIIth century. One of the symptoms of increasing problem with political clientelism could be a high popularity of primitive entertainments like gladiator fights. Therefore it is always useful to observe changes in culture, because this gives us a chance to predict social and economic processes we cannot measure statistically for some reasons. Costs of occupying many large (i.e. with numerous inhabitants) countries and protecting a very long border. These are more or less the logistic costs, as Paul Kennedy describes them. Decreasing country's income because of crisis that was launched by diffusion powers. Increasing costs of continuous wars with barbarians who grew in number and strength (effect of importing Roman military technologies) because of the same diffusion powers. Diffusion powers launched by Roman conquests were responsible for one of the longest economic recessions in history. Of course this crisis had some intervals, and the same time some provinces like Gallia (France) or provinces in Asia could experienced periods of economic growth thanks the implementation of Roman technologies and the law system. About the end of II century AD political system of Roman Empire regressed from from populistic to feudal. As with the fall of democracy, is hard to give an exact year date here, because it was a gradual process. I can only say this was happened probably between year 180 AD (death of imperator Marcus Aurelius at the end of serious wars with German tribes of Marcomans) and the edict of emperor Caracalla (212 AD) which granted citizen status to all free people who lived in the Empire. That way emperor Caracalla gained extra money from new citizens. Because of economic crisis income from taxes shrank. That forced Rome Emperors to increase taxation and to spoil the money (decrease the amount of precious metals in coins - a historical receipt to start inflation which always helps to finance government spendings). Unfortunately the side-effect of inflation is always the destruction of credit system plus the higher transaction costs of every trade transaction. Because of the fall of the trade, economic power of the cities declined. And many richer citizens moved to rural areas to avoid high taxes and other tributes for the state. Slavery production on large plantations became less and less effective because of shrinking trade, increasing costs of capital and workers resistance. Therefore, large land owners started to prefer small farms with feudal-dependent peasants over the organized slavery plantations. Rome as the rich state was an immigration destination country for many barbarians, a long before their forces invaded Roman Empire. It was very similar process like Muslim immigration to EU, with the same social and political consequences, but of course the scale of immigration in Ancient Rome was greater. Social processes like: shrinking of the liberal-oriented middle-class (and thus decay of rational ideologies promoted by that class), long lasted economic crisis plus natural disasters launched by that crisis (like great plague in the last decades of II century), and need for ideology that could cement the resistance against government and economic oppression - all those reasons increased the popularity of different religions (cults of Kybele, Isida, Mitra, etc.) imported from the East. Change from populistic to feudal system in a short run increased the military power of Roman Empire, but couldn’t stop the diffusion processes, so the final fall of the Empire was unavoidable. Long-distance trade which glued the state shrank so much that the Empire finally broke into a few pieces (which was the beginning of feudal fragmentation). Eastern part of the Empire (Byzantium) which was composed of mostly civilized lands, survived the crisis, but the Western part that consisted of many less-developed lands conquered on barbarians was completely destroyed by the invasions of German tribes in the Vth century AD. Generally, first chronicles that are describing the history of the beginnings Rome were written in Ist century BC when Rome was populistic or at best in IInd century B.C, when the democratic system of Rome was decomposing. Ancient historians were not always objective (impartial), and they obviously weren’t know for sure some facts from the first centuries of Rome (especially because some documents were lost in the time of Celtic invasion - 390 BC). Moreover, many parts of later historical documents and chronicles were lost too. So, you have to be aware that facts from the democratic period of Rome history are not always certain. For example I know two variants of history of Spurius Melius. Which one is true? On the other hand, statistical information about the number of Roman citizens are precise because were systematically collected by the democratic administration of Rome, and the number of citizens of ancient Athens we can only guess.